So the Green Hornet movie finally sees daylight after more than a decade of talks, shelvings, and revivals. So far, we know that Seth Rogen will play the title character. Joining Rogen on the script is Evan Goldberg and the film will be directed by Michael Gondry. They’re also appear to be talking to Nicholas Cage and Cameron Diaz for supporting roles. No word yet on who’s playing Kato. If you’re thinking what the heck Seth is doing as title character, don’t you worry since he’ll be put into a strict regimen to make him fit for the role. 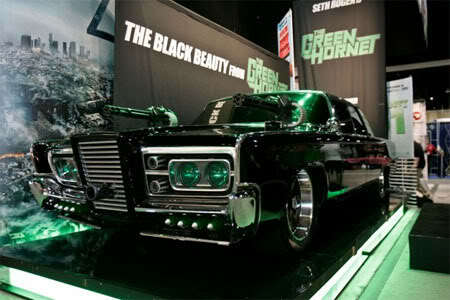 Anyway, since it’s Comic-Con, the Green Hornet panel brought something very nice to San Diego – The Black Beauty car.